Over the past few years, UAE’s lubricant market has witnessed increasing demand of synthetic lubricants. Focus towards using Synthetic Lubricants: Synthetic lubricants are cleaner lubricants as base oil used in their manufacturing is highly refined. They are known to augment engine performance, last longer and preserve engine life. They are most recommended lubricants to be employed in industries that use heavy machinery. Increase Use of Recycled Oil: UAE has witnessed increasing use of recycled oil which is cheaper to refine than crude oil. Synthetic lubricants produced from used oil are of quality standards that are in accordance with reputed institutions such as American Petroleum Institute and European Automobile Manufacturers’ Association. In addition, rising awareness among customers to prevent degradation of environment and bring market standards to a minimum grade has helped in fuelling growth of synthetic lubricants market. Bio-based synthetic lubricants are gaining traction in UAE. They are low in content of phosphorous and sulphur which prevents environmental degradation. In addition, they are suitable of variety of cars and commercial vehicles and have gained acceptance by leading OEM’s such as BMW, Mercedes Benz and Porsche. 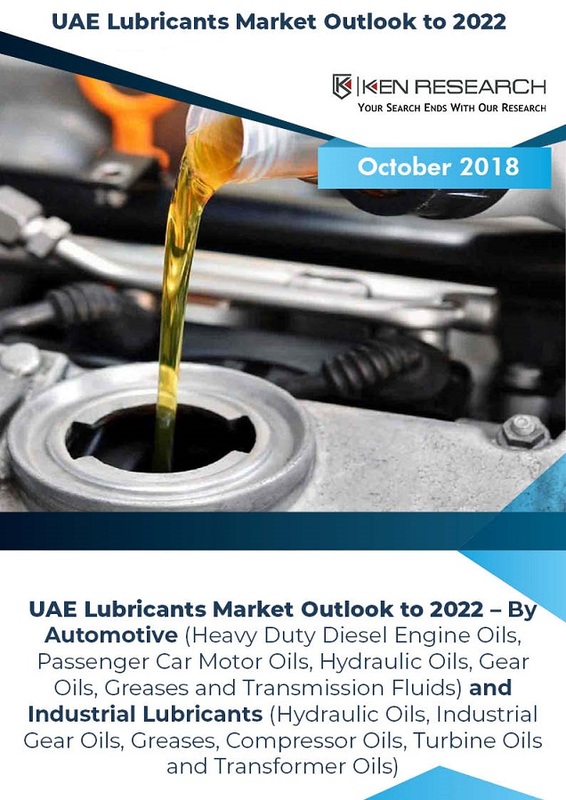 The report titled “UAE Lubricants Market Outlook to 2022 – By Automotive (Heavy Duty Diesel Engine Oils, Passenger Car Motor Oils, Hydraulic Oils, Gear Oils, Greases and Transmission Fluids) and Industrial Lubricants (Hydraulic Oils, Industrial Gear Oils, Greases, Compressor Oils, Turbine Oils and Transformer Oils)” by Ken Research suggested a growth at a relatively low CAGR of 0.8% in terms of production volume in UAE Lubricants market in the upcoming years till the year ending 2022E. Emirates Lube Oil Company Ltd.